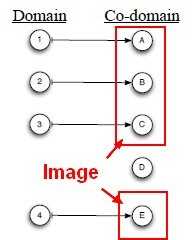 The output of a given input is called the image of that input. The image of A under the function f is denoted f(A). 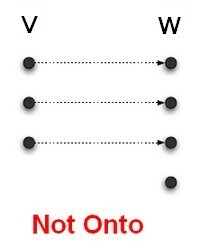 There might be elements of the co-domain that are not images of any elements of the domain. denotes all functions from D to F.
Functions f and g are functional inverses if and are defined and are identity functions. A function that has an inverse is invertible. 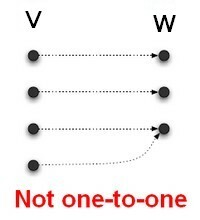 Function Invertibility Theorem: A function f is invertible if and only if it is one-to-one and onto. is onto and one-to-one and therefore invertible. One-to-One Lemma: A linear function is one-to-one if and only if its kernel is a trivial vector space. Equivalent: if its kernel has dimension zero.